The endangered Earless Dragon is being used to justify killing thousands of Eastern Gray kangaroos in Belconnen and Majura, but the motive is really developers’ profit. As grasslands are turned into building sites, as human population growth is encouraged.. Kangaroos are in the way, as is democracy, so both are being buried. When an Earless Dragon is like a smoking gun we should ask who fired the gun. Did the ACT government organize the mass killing of thousands of Eastern Grey kangaroos in Belconnen and Majura, near Canberra, in a sudden uncharacteristic and galvanic effort to save the endangered Earless Dragon? 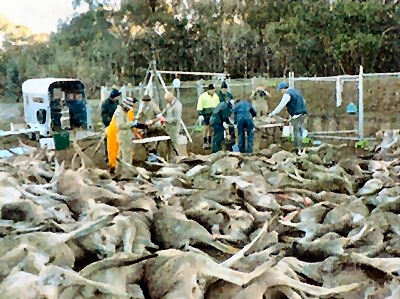 Thousands of Eastern Grey kangaroos have recently been shot and bulldozed into pits in Belconnen and Majura,  Australian Capital Territory (ACT), in fatal massive round-ups which have not been seen since early last century. In a torrent of official reports and statements, scientists and politicians have fingered the Eastern Grey Kangaroo for overgrazing rare grasslands and thus threatening their other inhabitants, notably the endangered Earless Dragon. Who would have thought that the little Earless Dragon had such powerful friends in government, planning, universities and business – even the Canberra International Airport? The Grasslands Earless Dragon doesn’t pay taxes and doesn’t directly contribute to political fundraisers, but it is often associated with grants and development programs these days. Were these culls really for the benefit of the Earless Dragon? Or was the Earless Dragon only an excuse for this macropod massacre, in which case, what was the real motive? Although these planned culls aroused public ire and many questions, formal responses were highly selective. Many questions about the Belconnen cull went unanswered and remain unanswered. When the Majura cull came up on the agenda, the same angry questions received the same infuriating non-responses. The public and the kangaroos deserve much better. It was so difficult to make sense of what was happening. Could the whole thing actually be as cruel and stupid as the kangaroo-cull protesters claimed? Or were the protesters really childish people who could not accept the obvious need to put some animals which had ‘bred like rabbits’ out of their misery? After all, the Royal Society for the Protection of Animals (RSPCA) had given its seal of approval. That meant it must be okay, right? Right? My own preoccupation over the months intervening between the Belconnen and the Majura kills had been to ascertain what population theory was used to arrive at the diagnosis of overpopulation or to assert that there should be only one kangaroo per hectare. My search failed. This question has now become one of whether there was any population theory at all. A theory of how kangaroo populations behave is necessary for any outsider to be able to test the validity of the judgement that the Majura Roos or the Belconnen Roos or any other roos were overpopulating and needed ‘culling’. Saying that there should be one per hectare or that they may die of starvation are remarks which, on their own, do not justify culls. I was amazed that official reports did not begin with a description of how kangaroo populations were thought to operate, how this theory had been tested and the populations measured. In an effort to find out if any real theory and application had taken place, I attempted to contact officials and scientists involved in kangaroo management programs of one sort or another. No population theory of any kind, whether or not demonstrating lemming-like multiplication tendencies in kangaroos, has yet surfaced as a reasonable basis of the culling of the Belconnen or Majura roos. 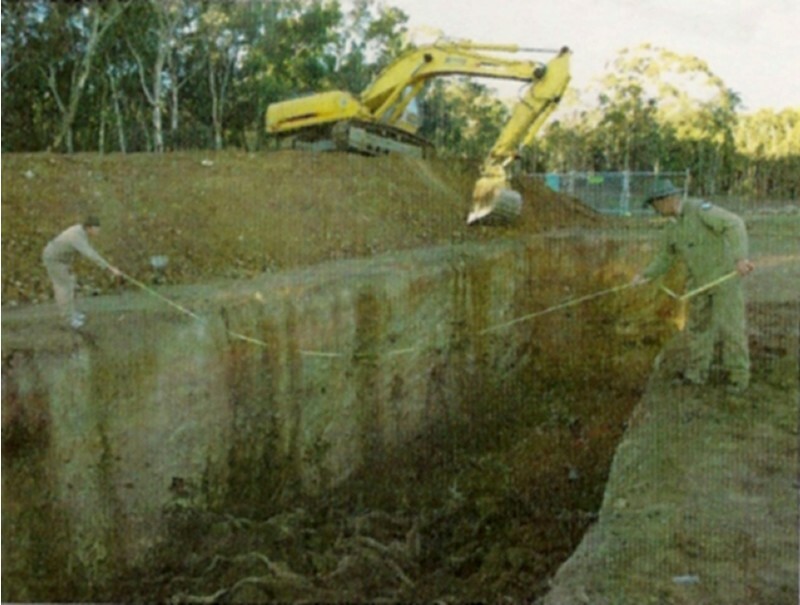 One scientist who was closely associated with the Belconnen cull and the Majura cull, was Don Fletcher. Fletcher is the Senior Ecologist in Research and Monitoring in Parks, Conservation and Lands, Department of Territory and Municipal Services, ACT. His involvement in the Belconnen Roo cull seems to have been officially limited to capturing then releasing female survivors after inserting contraceptives in them. He was one of the writers of the public consultation document leading up to the Majura cull. Coulson’s study of kangaroos at 2.2 per ha was published in 1999 as Coulson G, Alviano P, Ramp P, Way S “The kangaroos of Yan Yean: history of a problem population”. Graham Coulson’s Yan Yean article is frequently cited by kangaroo population students and he seems to be thought of as the originator of the “one kangaroo per kilometer” ‘rule’. I did contact Dr Fletcher by email, and he was initially quite friendly, but when I attempted to ask him questions about his thesis responses to my emails ceased, even though I re-sent the emails. The ACT Kangaroo Advisory Committee Report No.1 (issued prior to the Majura cull) reported conflict between kangaroos and the rural community which uses 23% of the ACT. It stated as fact anecdotal reports that kangaroo populations ballooned due to man-made pasture improvements. Other ACT researchers have also questioned the logistical principle of blaming kangaroos for human pressures on the environment, i.e. why blame kangaroos when we know that the damage is outstandingly done by sheep and cattle? In the Olsen and Low report case cited below the researchers are talking about farming, but they could just as much be talking about new suburbs, i.e. why blame kangaroos when the damage is obviously being done by human population growth, accompanying infrastructure and housing development (roads and suburbs), and human activities (driving cars, growing lawns, shopping, expansion of production, etc.)? The discontinuation of damage mitigation as grounds for harvesting is in many ways a more honest approach to kangaroo management given that damage is difficult to monitor, predict and even to prove empirically to be an issue. It also removes the implication that kangaroos are pests. Is the real conflict over the grasslands between developers and kangaroos rather than kangaroos and earless dragons? Fletcher, in his thesis, describes Kangaroo density in the ACT as having “increased more rapidly from 1996 to 2000 after sheep and cattle grazing had ended.”  Sheep and cattle had been allowed to graze in the threatened grasslands. In some cases they have even been returned to the areas where kangaroos have been ‘euthanazed’ to protect those fragile grasslands. The question asked here should not be whether the kangaroo density increased to take up pasture vacated by sheep and or cattle. The real question should be: Did such a reduction in sheep and cattle grazing then bring the unfortunate kangaroos into conflict with urban developers over the rezoning of agricultural land for rural use? In fact, if we drop the non-issue of kangaroo numbers, the relevance of developer-ambition conflicting with retaining grasslands for any indigenous animals becomes obvious. Kangaroos graze there, which is obviously better than sheep and cattle grazing there, but property developers want to raise far more lucrative crops of humans there by building roads and houses where kangaroos now graze, along with earless dragons. “Protecting lowland native grassland from development is also a challenge as these areas, being generally flat to gently undulating with no trees, are often prime potential development sites. Much of Canberra’s development is on lands that were once lowland native grassland.” Maxine Cooper Report, p. v.
Now most of the competition with kangaroos is from property development. Stimulating property development is government policy and the means of stimulus is a policy to encourage interstate immigration and natural increase through baby bonuses. This government decision to stimulate human population growth in the ACT and to expand development in the ACT causes pressure on the local kangaroo population and the population of the Earless Dragon in the ACT. The commercially-based decisions about human population policy which cause these pressures, however, are kept entirely out of official calculations, negotiations, and rationales pertaining to kangaroo culls and definitions of kangaroo overpopulation in Belconnen and Majura, ACT. This omission means that the public do not have the information to hold the government responsible where it should be held responsible, nor to question the costs of its policies. This represents a grave failure of public education and democracy. Oddly, Maxine Cooper, in her “Report on ACT Lowland Native Grassland Investigation,” 12 March 2009, mentions and notes the threat to the grasslands from development, yet she does not factor this logically into the reasonableness of blaming and killing kangaroos. Instead, she uncritically accepts the illogical explanations which she is provided with about kangaroos. She even provides further faulty measures of kangaroo population densities by rate of car-kangaroo collisions. Although Maxine is aware that the building of roads and suburbs is impacting the grasslands, she does not stop to think that these are also impacting the kangaroos through an increasing rate of driving them out of their habitats and onto the roads to make way for houses. If, however, commercial development pressure were properly assessed, then its role as the primary population impact on the grasslands and the cause of ACT policies to depopulate kangaroos would become obvious and the government would no longer be able to deflect criticism of overdevelopment and cruelty to kangaroos. Who profits? 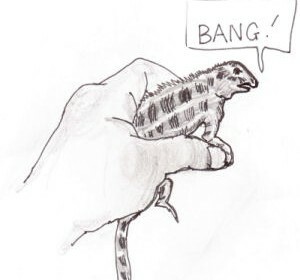 When an Earless Dragon is like a smoking gun we should ask who fired the gun. What of the Earless Dragon in all this? Small and scarce, it is not hard to imagine it fitting into a developer’s pocket-size native-style garden. You could even imagine thirty-something refugees from housing prices in Sydney and Singapore cultivating it in garden pots in new high-rises. Imagine is the key, since who would check up? Pardon me for being skeptical, but the high profile of the Earless Dragon makes me think of advice to writers about mentioning loaded guns in detective stories. If there is a gun it is there to shoot a victim for a motive. The huge importance suddenly given to the humble Earless Dragon bespeaks a greater purpose than the self-evident worth of its own preservation. Cherchez le maccabe. [Find the cadaver.] The Dragon is the weapon to get rid of the much-loved kangaroos. There can be no argument there, for we hear little else but how the kangaroos are threatening this little animal. Once the kangaroos are gone, the tiny Dragon’s profile will almost certainly sink back to the level which escapes most humans’ notice, unreported by the mainstream press. Let us ask the ever-useful sociological question here. Who benefits? Developers and their friends do. You wouldn’t think it from listening to politicians, but I have it from a reliable source that, in the ACT, the biggest source of public complaint is cruelty to animals. People should realize that they are not alone in their horror at the cruelty entailed by all this unwanted (except by its few focused beneficiaries) and costly population growth and development. The Earless Dragon has been deployed with the effect of sowing paralysing confusion among nature groups by implying an ungenerous bias for furry kangaroos against ugly dragons. This has the hallmarks of a straw man argument. Let the community be heard as it rises to save the grasslands and return them to their rightful management by kangaroos and Earless Dragons. Let due opprobrium be publicly dealt the Growth Lobby by exposing its greed and cowardice in orchestrating the cold-blooded execution of thousands of living, breathing, social creatures for economic and ecological crimes they could never have committed, merely to defend its exceedingly narrow and debt-ridden interests. Let us sheet home to the Growth Lobby and its minions in government the depravity with which they attempt to corrupt our wider society. We are not cruel or injust. We do not support cruelty and injustice. Some of Cooper’s other recommendations (apart from those which promote the culling of kangaroos on illogical grounds) are good. I provide these in the appendix to this article. Oddly, at the same time as kangaroos were banished from the ACT, the Earless Dragon also became scarce. It couldn’t have been because of too many kangaroos. During the investigation, the Commissioner’s Office found it difficult to identify the location of lowland native grassland sites relative to planning zones that guide land use. To help the community and developers gain information on grassland sites relative to planning zones it is recommended that a map of the location of lowland native grassland sites relative to planning zones be published. The natural connections between grasslands and adjoining woodlands have mostly been severed, but should be retained where they still exist. • Majura Valley at the Majura Training Area (MA01). “About 2000 eastern grey kangaroos at the Department of Defence’s Majura Training Area have been culled this week, with a further 4000 expected to be shot. Defence confirmed yesterday that culling had begun on Tuesday and contractors doing the cull had already achieved about a third of their target. Defence spokesman Brigadier Brian Dawson said there were about 9000 eastern grey kangaroos on the Defence-owned site, and they would reduce the population to the ”sustainable level”, a density of one per hectare. This would reduce the population to about 3000. Kangaroos Threaten One Of Australia’s Last Remaining Original Grasslands, And Endangered Animals (http://www.sciencedaily.com/releases/2008/05/ 080521114923.htm) “The eastern grey kangaroo (Macropus giganteus) has always been part of the cityscape of Canberra, also known as the “bush capital” of Australia. But even Leipzig-based scientist Dr Marion Höhn and Anett Richter of the Helmholtz Centre for Environmental Research (UFZ) are surprised by the high numbers of them. In her doctoral thesis, Anett Richter is investigating how selected invertebrate species such as ground beetles are affected by landscape fragmentation and habitat alteration in natural grasslands in the Australian Capital Territory (ACT). Yet during her fieldwork she discovered that there were far fewer of them than expected. In Peter Robertson & Murray Evans, /files/earless-dragon-management-2009-tympanocryptis-pinguicolla.pdf National Recovery Plan for the Grassland Earless Dragon Tympanocryptis pinguicolla, published by the ACT Department of Territory and Municipal Services, Canberra, 2009: http://www.environment.gov.au/system/files/resources/43f24013-b621-4ff6-bf09-34da942e8ced/files/tympanocryptis-pinguicolla.pdf the Canberra International Airport is listed as responsible for the management of earless dragon habitat at the airport (p.9); as possibly relatedly suffering economic impacts (p.12); as supporting ongoing studies p.19. Don Fletcher, “Population Dynamics of Eastern Grey Kangaroos in Temperate Grasslands,” was on line as a pdf, which is the form I downloaded it as. A copy is preserved now under this article, linked here: /files/Fletcher-kangaroo-thesis.pdf because the pdf is now of limited availability, although copies are still at the University of Canberra Library, reference: http://nla.gov.au/anbd.bib-an42269526. A book by the same title and author has also been published. There are 100 ha in one square km. So if density varied between 450 and 510 kangs per square km, then that is 4.5 p ha or 5.10 per ha. With 220 per square km 2.2 per ha. Coulson G, Alviano P, Ramp P, Way S (1999). “The kangaroos of Yan Yean: history of a problem population”, Proc R Soc Vic 111: 121–130. In Note 11: “The 2007–08 State of the Environment report states that motor vehicle accidents involving kangaroos has increased by 38% (from 563 in 2005–06 to 777 in 2006–07). Rangers have advised that they now attend more than 1,000 roadside kangaroo incidents per year in Canberra.” Although Maxine is aware that the building of roads and suburbs is impacting the grasslands, she does not stop to think that these are also impacting the kangaroos through an increasing rate of driving them out of their habitats and on to the roads. Nor does Don Fletcher, in his thesis, where he accepts reports on increasing rates of car collisions with kangaroos in Victoria, also a state with a population growth policy which manifests in rapid population growth and development and rapid depletion of kangaroo habitat. A Pictorial Guide to the Kangaroo Culling Issue (2006) from the ACT Department of Territorial and Administrative Services. “Majura Valley’s large, intact lowland native grassland area, which consists of a number of sites under the control of various government agencies, does not have long-term planning protection; it is not in a reserve and there is no commitment for this to occur. Source: The ACT Conservation Council description of the Grassland Earless Dragon – Typanocryptis pinguicolla. She also makes environmental and sociological films, including a series on wildlife corridors and kangaroo populations. We can only wonder about the status and authenticity of scientists, ecology, and our understanding of our wildlife, if underneath the science is really the housing lobby? Focusing on legless lizards and sun moths, while they get eradicated without a whimper by housing growth, surely is about manipulating the “green” groups with hidden agendas? It’s assumed that kangaroos are separate, or equal to vermin, rather than being genuine Australian naive species! How can the public be so naive and gullible, and not discern the real issues here? There must be social, political and economic factors driving these senseless kangaroo “culls”, and genuine opposition is blocked by the legal system. This is a government with a devious and robotic mentality driven by greed. If there is definitely one species in plague proportion and must be reduced that it is us people. This is the fundamental problem. WAKE UP! !